My 20' Scout loaded and ready to go. Driven by my son, Kevin. My 20' Scout can very comfortably fish up two three anglers especially when drifting live baits. For more aggressive plugging and casting or snagging live bunker, two anglers is a better choice. 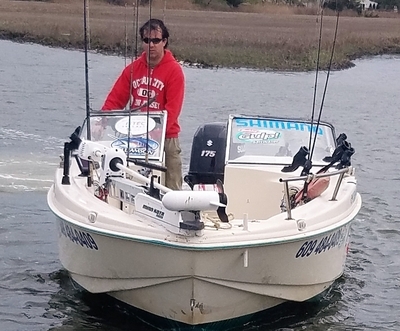 I can actually handle a fourth fisherman quite well, but it does start to get a little cramped and it will limit some trips especially when there are schooling fish off the beach. Please note that if I ad a fourth angler to the boat there will be an additional charge. If you have a larger group I may be able to connect with another guide so that everyone can have an intense fishing experience. Your trip includes all the bait you will need. For Fall Fishing Live Spot are probably the ultimate bait. I include a dozen with the price of a charter. Some days the bite is hot and a dozen Spot disappear so fast that you need more. I always put extra in the live well that will be available at current market price. Besides Spot, I usually carry a supply of Live Eels, Surf Clams, Fresh Bunker and Live Peanut Bunker and Mullet when available. When we leave the dock I am always ready for the best day ever and want to take advantage when the Magic Bite materializes and you can never know until that happens. 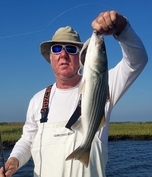 I have found that the Berkley Saltwater Gulp is a fantastic Striper Bait and as a Berkley dealer I will always have a great assortment on board. After a day on the water I'm sure you will be buying a big supply to take home with you for all your fishing. Tackle wise I always have plenty on the boat, a combination of spinning and bait casting in light and medium weights so we can match the conditions. You will find a variety of makes and models including some demonstrators so you can see what best suits your style of fishing for later purchase. All are generally filled with braided line including Power Pro, Suffix and Stren Super Braid all of which I find very forgiving and easy to fish. I include terminal tackle and use only premium hooks and flurocarbon leaders. When lures are ticket to our action I always have a large selection on board so we are sure to have the right one at hand. Though loosing a rig or lure or two is considered the cost of doing business, sometimes things get crazy especially if we tackle a school of marauding bluefish. When this happens I do expect to have lures replaced if there is there is excessive loss. If you are bringing your own tackle, which I encourage, I suggest medium to medium heavy graphite rods rated for 12 to 20 lb. line with a reel with a good drag. Spinning or Baitcasting tackle is equally effective and you should choose whatever you are most comfortable with. 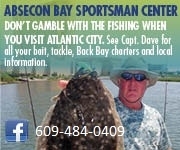 I am always happy to discuss your tackle choice so give me a call before your trip.